In the times where there are multipurpose all-in-ones all around, the Pixma IP2850 comes in as an anomaly. It is a single function device intended to be a printer that does just that, print. The Pixma targets those few home and small office users, which have a very infrequent printing requirement. The printer comes with a maximum possible resolution of 4800 x 600 dpi with which it produces really good quality prints both monochrome and colour. Being a very basic device, the maximum speed is 8 ppm, which might look slow, but should be enough for really low usage which the printer intends to cater to. The printer comes with a single Canon Pixma iP2850 Ink Cartridges having all 3 inks in one cartridge, which makes refills and replacement a costly option. The costs can be, to some extent, reduced with the use of compatible cartridges which are easily available in the market. The normal cartridges claim up to 180 A4 printouts, and high-yield versions produce up to 300 prints. The high-yield versions can take the costs of operation lower, but as a single cartridge contains all colours, they need to be replaced even if only one colour has finished. The Pixma IP2850 comes with a small input tray with a capacity of about 60 pages. This also looks low but given the low usage that the printer will be subjected to, it is good enough. The only connectivity option is USB 2.0 at the back of the printer. Other than that there are not many controls or sockets for anything else in this printer. The printer is exceptionally light at 2.3 kg and looks extremely sleek and stylish. It comes in the choice of just one colour, white with black lettering. With its compact dimensions, it can fit even the smallest of computer tables. Canon Pixma iP2850 is made for the sparing user, and it does its job well. Despite fewer features and lack of connectivity options, it gives really good quality printouts, which are better than some much costlier all in ones also. The ink costs and wasteful replacements can cause the cost of operations to go up a notch. The printer is made for a purpose and that purpose it serves well. What to do in case you receive blurry and uneven printouts from the Canon Pixma printer? Step1: Print the nozzle check pattern. Use the online user manual available to refer how to print the nozzle check pattern of your printer. Step2: Examine the nozzle check pattern. If there are missing lines or horizontal white streaks in the pattern, you should clean the Canon Pixma iP2850 Ink Cartridges before the warning. Step4: Clean the print head deeply. Perform the print head deep cleaning if the print results are still not satisfactory If the problem is not resolved, turn off the power and clean the print head deeply again after 24 hours. Sometimes deep cleaning improves the print results. If the problem is still not resolved to proceed to step 5. Step5: Replace a Canon Pixma iP2850 Ink Cartridges. When print head deep cleaning gives unsatisfactory results then, it might be possible that the cartridges are damaged and we need to replace the ink cartridges with the new one. Note: If the problem is still not resolved after replacing the Canon Pixma iP2850 Ink Cartridges, contact the service center. Q. Can I use Canon Pixma iP2850 printer for performing multipurpose work like copying, scanning and faxing? A. 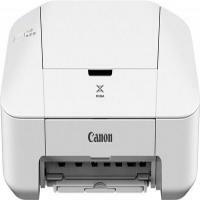 The Canon Pixma iP2850 printer is a single function printer that cannot perform multiple task simultaneously. It cannot scan, copy or fax the documents. Q. Can I pay in cash for my order of Canon Pixma iP2850 Ink Cartridges at the time of delivery? As I am concerned with my credit or debit card details being misused by any third party while making a payment online. A. Unfortunately, we do not offer cash on delivery services. All our payments are made online only. You can pay by using Laser Card, American Express, MasterCard or Visa credit card, Maestro, Switch, Solo or Delta debit card. When you purchase any item on this site the payment will be hosted by Sage Payments to make sure that you get maximum security of your credit/debit card details. Q. What is the expected page yield from Canon Pixma iP2850 Ink Cartridges? A. You can print approx 400 pages from 17 ml of black ink and 300 pages from 16.5 ml of tri-colour cartridges. Q. While looking for the low-cost cartridges, I have tried using a refill kit but it didn’t work well for me. What makes your compatible Canon Pixma iP2850 Ink Cartridge different? A. We do not recommend our users to use refill kits as they do not tend to work well like the compatible ones do. The reason is, we clean the cartridges, dry them and then refill ink in the cartridges under proper temperature and environmental conditions. This ensures that there are no air bubbles trapped in the print head, and you get a flawless print every time. All the compatible cartridges we supply are tested to highest quality assurance in order to ensure maximum safety. Q. The waste ink absorber is full. This is the first time I have purchased a printer for my home and do not understand what should be done next. Could you please help? A. Sure. The waste ink absorber is made to safely collect the ink that is expelled during print head cleaning or borderless photo printing. When the absorber is full you will need to replace it over time. We suggest you to replace the absorber by visiting the nearest Canon authorised repair centre. That will help you to carry out the replacement safely while preventing ink leakage and damage to the printer. Q. Can you deliver compatible Canon Pixma iP2850 ink cartridges outside UK and Ireland? A. We would definitely like to extend our services outside UK and Ireland in future. But unfortunately our current services are available only in UK and Ireland. We can accept your orders if you would like to deliver the product to UK or Ireland-based address. Q. As I print on everyday basis, I would like to prepare for my urgent Canon Pixma iP2850 ink cartridge needs. Does your website have any urgent requirements policy? A. Thank you for the question. We do not have any urgent requirements policy as such. But for urgent requirements we would like to inform that if you place the order for your Canon Pixma iP2850 ink cartridges before 12 noon we guarantee to dispatch the order the same day (considering the availability of the stock). And in any case you are unable to do so please contact us on 04830833221. We will consider the best possibilities from our end. Additionally, we recommend you to keep a sufficient stock of ink cartridges to meet the urgent requirements. That is one of the best ways to save the time while also meeting the urgency. Q. Do compatible Canon Pixma iP2850 ink cartridges guarantee seamless compatibility with Canon Pixma iP2850 printer or original cartridges are a better choice? A. Compatible Canon Pixma iP2850 ink cartridges offer the same high quality results when used with Canon Pixma iP2850 printer. They deliver flawless results in the form on finest quality output. In fact, you save more when you choose a compatible ink cartridge over a genuine one so in that sense, they make for a better choice. Q. I thought of purchasing a Canon Pixma iP2850 ink cartridge (PG-545- black specifically). However, I saw a message that non-genuine cartridges may be physically different as compared to genuine counterparts. Now I’m a bit unsure about buying it. Can you please suggest what I should do? A. You need not worry about the message you read. It’s just because of patent restrictions and It is just a precautionary step the company must be taking. You can rest assured that you’re your PG-545 Black is fully guaranteed to work as well as an original ink cartridge would. Q. I need to take several printouts every day in office for work-related purposes. My office staff recently purchased Canon Pixma iP2850 printer along with compatible Canon Pixma iP2850 ink cartridges (both, black and colour). Should I accept both the products or suggest some other models? Please help. A. You can certainly go ahead with both; your office staff has made the right choice. Canon Pixma iP2850 printer is counted among the best not only for print quality but also for the large number of pages it prints. Q. How many pages can the Canon PG545/ CL546 ink cartridges multipack print? A. The Canon PG-545/ CL-546 ink cartridge multipack provides an approximate page yield of 360 pages per cartridge while providing 5% coverage cover area. Q. What is special about the ink used by the Canon Pixma iP2850 printer? A. The Canon Pixma iP2850 printer uses hybrid ink system and dye-based inks for both colour and black cartridges. Q. Can the Canon Pixma iP2850 printer print on different types of pages? A. Yes, it prints on a wide range of paper sizes such as photo paper. Q. What is the capacity of ink in the standard size PG545 / CL546 ink cartridges? A. Each standard size Canon PG545 / CL546 ink cartridge has a capacity of 8ml each. Q. I need to buy new ink cartridges for my Canon Pixma iP2850 printer. Will opting for XL cartridges be more feasible for me since I take printouts quite frequently? A. Yes, buying compatible XL Canon Pixma iP2850 ink cartridges will yield more printouts and save you the cost and trouble of replacing them for longer. You’ll save as much as nearly 30% per page with XL cartridges if you choose these over standard equivalent models. Q. I replaced Canon Pixma iP2850 ink cartridges only last week hardly used the printer (I used compatible ink cartridges this time). However, still the printer has been showing incorrect ink levels. What should I do? Take out the cartridges and disconnect your printer from the plug socket for at least 30 seconds. Plug the printer back in to switch it on. Insert the ink cartridges now and wait for the error message to be displayed. Look for the ‘stop’ button on your printer and press it gently for at least 15 seconds. Q. Will it be ok to install only black cartridge or colour cartridge in my Canon Pixma iP2850 printer? A. Although you can use your printer and take printouts with only one of the ink cartridges inside, you’ll notice that the quality of printouts will deteriorate and irreversible blockages may come up within the printhead.